Your coffee taste has evolved from those three a.m. coffee drip college nights. You’ve tasted other types of beans and probably developed your style of brewing. You’ve left behind those traditional drip coffee makers, right? Hold that thought. Even though it might not be the most revelatory cup of coffee you’ve ever tasted, there are a few distinct benefits to keeping a small 4 cup drip coffee maker around. In this article, we’ll take a closer look at the different models on the market and their individual pros and cons. 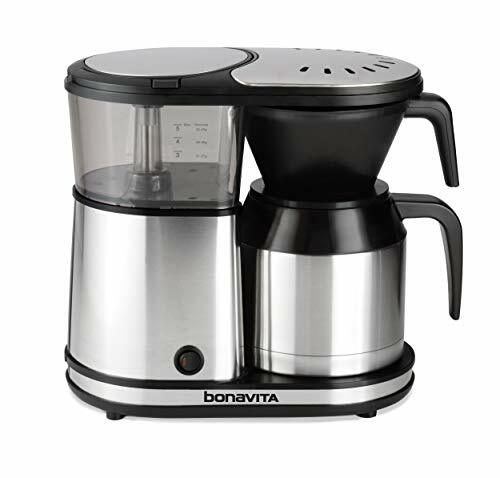 This machine is a smaller version of Bonavita’s flagship coffee maker that has been approved by the SCAA. What does this certification entail? It means that experts have approved it; that it brews at a perfect temperature and extracts all the good stuff from the beans. It doesn’t hurt that it looks a lot better than most of its competitors. Why use a small coffee maker in the first place? When you have people over, or when your family is in town, they may not be as amenable to waiting around for artisan coffee. Honestly, it’s just faster and easier to get a machine to do the work. If you have a drip coffee maker, you can satisfy the craving of the crowd. You might roll your eyes and try to get them to try a French press at least once the craving is satiated, but for pure utility sake, you can’t beat the ease. Another reason to keep a drip is that you can usually set a timer to start brewing. On mornings when you don’t have time to prepare coffee, you can have coffee ready when you wake up. Again, not the best cup of coffee you’ve ever had, but better than none at all. Plus the smell of coffee already brewing when you wake up kind of makes up for the taste. Since you aren’t planning to use a drip as your backup method of coffee brewing, it doesn’t make sense to keep a large unit around. A small 4 cup coffee maker should be enough to make a few quick cups and then store out of sight until next time the family is visiting. That being said, if you opt for an espresso-style machine, it might be a little bit bigger because many come with attachments that can do other things such as froth milk. It’ll need more space, but the versatility might be worth sacrificing storage. One last option is to go even more minimal and choose a brewer that is best suited for one or two cups of coffee. I like this option since, you can get some great value for money in this category. The DRX5 is a compact programmable coffee maker that is space saving. Its simple design allows you to make coffee without sacrificing much storage space. It’s small enough to be left out on a counter without being in the way in most average sized kitchens. The carafe is glass, and the system uses standard, flat-bottomed, paper coffee filters. It has an on/off switch to make it easy to see if the burner is still on and it features a timer so you can plan a brew time of up to 24 hours. It also has a pause brew function if you need a cup before the entire carafe is finished brewing. This can also be used to pre-infuse the brew, just like a genuine Portland hipster would do. It’s incredibly affordable, and the entire system is easy to clean. The reservoir drains entirely, and the carafe is dishwasher safe. One of the downsides is that the lid of the carafe is a little flimsy, but if you aren’t using it every day, this won’t be a problem. The glass carafe loses heat quickly, but at only four cups, you should be able to drain the carafe before it’s too much of an issue. Programmable – plan 24 hours ahead. 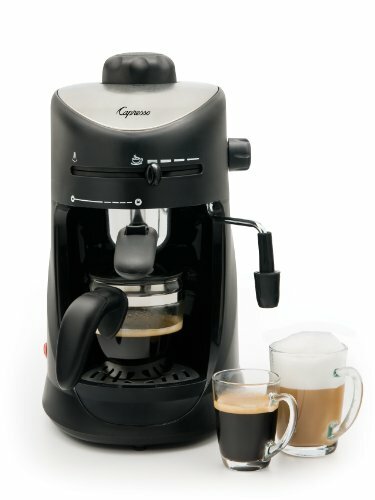 This model makes great coffee and compared to many of the coffee makers in this price bracket it looks the part. Bonavita is popular with the specialty coffee crowd. Their coffee makers are often heralded as the thing that gets closest to a barista level pour over cup. This model is no exception. It has pre-infusion and uses a special showerhead to disperse the water that’s designed to better extract the flavors from the coffee. It also has a thermal carafe that will keep your coffee warm, which is a lot better than relying on a heat plate that will slowly evaporate the coffee and turn it into a bitter liquid. The only tiny minus with this model is that the carafe is a little difficult to pour from without the lid installed. It’s not difficult to screw it on after the brew, however. The bigger version of this coffee maker has been certified by the SCAA, so there’s no doubt that you’re getting quality. The DCC is a four cup coffee maker with a stainless steel carafe. It has a knuckle guard and a no-drip spout. 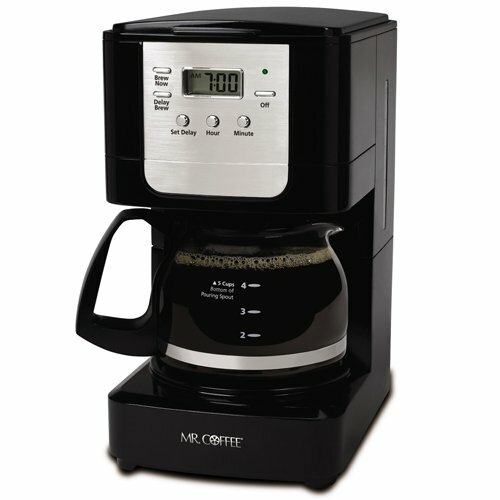 It is an ultra-compact coffee maker that can stay on the counter without taking up much space. One great feature of this maker is the pause-brew function. If you need a cup of coffee before the carafe is full, you can temporarily stop the brew to get some without coffee spilling out. It doesn’t have a timer function, a downside, but it does feature a 30 minute shut off feature. It gives you plenty of time to empty the pot before things start to get cold. The stainless steel carafe is more durable than glass and safer than plastic. The water gets to a sufficient temperature to brew a robust cup of coffee, however. Be sure not to touch the carafe on the bare metal because it will be hot. Pause function – great for pre-infusion. 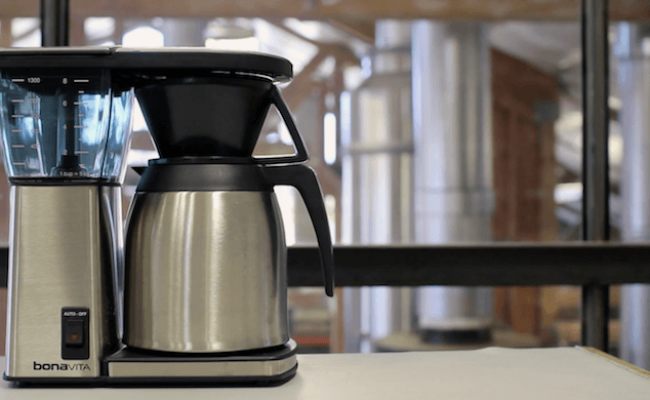 Stainless steel carafe – keep the coffee hot! If you want something a little fancier, the Capresso is a small espresso and cappuccino maker. You can adjust the strength of your coffee as well as a milk frother and steamer option. 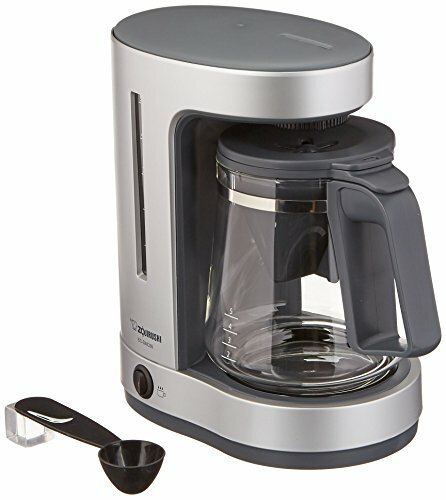 If you can’t stomach the idea of plain coffee, but still want the ability to brew quickly, this type of maker might be a better option. You can make both espresso and cappuccino relatively quickly, though the frother takes some practice. You can also adjust the level of steam. There are thumb guards and a boiler cap. It has a glass carafe that is dishwasher safe. It is easy to disassemble for cleaning, but you will have to remember to descale it every once in a while. It has a remarkably small footprint for a fancier coffee maker. It won’t take up much space in average kitchens making it easy to store on the counter. It doesn’t have a timer option, but it does have a wow factor for guests. The Zutto is a higher end drip coffee maker that’s rated to five cups. It features a charcoal water filter to improve the taste of the coffee, making it one of our best tasting drip coffee brews on the list. It’s a glass carafe with a cone-shaped filter. The cone shape ensures that water gets evenly through the grounds to produce a more robust cup of coffee. It’s easy to clean, and the water filter lasts up to two years with regular use. It also has a space-saving reservoir so you won’t have to sacrifice much counter or storage space. It does not come with many extra features such as the ability to program ahead, but it does feature an automatic keep warm function. It’s a little higher on the price point than a simple coffee maker, but if your water doesn’t taste great out of the faucet, the charcoal filter option might be worth the small extra cost. Mr. Coffee does drip coffee well. 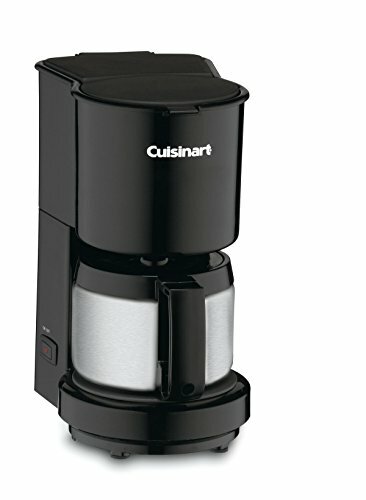 This is another programmable version of their classic coffee maker featuring a slightly bigger carafe size without sacrificing space or speed – technically it’s a 5 cup coffee maker. It brews a hot cup of coffee and has a keep warm function. You can program your coffee to start up to 24 hours ahead, and it has a convenient pause brew function so you can get a cup before the entire carafe is finished brewing. The carafe is durable stainless steel, which doesn’t allow you to see how much is left in the pot, but doesn’t break as easily as glass. It’s easy to clean with a removable filter basket, and the carafe is dishwasher safe. There’s no backlight on the time screen, but as long as you aren’t programming in the dark, this isn’t an issue. If you’re making coffee right then, it has a simple on/off switch. Go deeper: How to find the best 4 cup drip coffee maker? There are few key features that you definitely want to get right when picking a new coffee maker. Accurate brewing temperature should be at the top of the list. Coffee makers with crazy temperatures will either burn your coffee or won’t get the coffee hot enough to brew anything more than a weak puddle. Or just be inconsistent. ideally, you want a model that consistently brews around 195-205 °F. You also want a coffee maker that brews rather quickly. 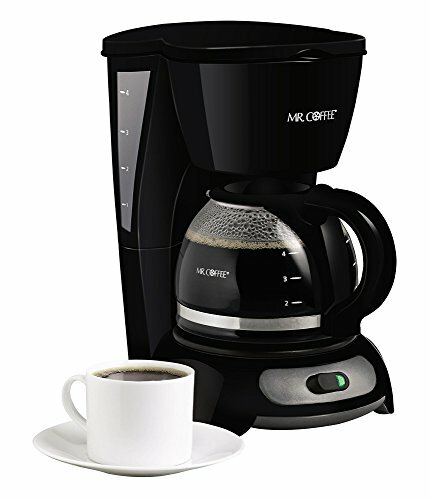 A 4 cup cone filter coffee maker should be able to brew a pot of coffee in minutes. The reason I’m mentioning this isn’t only because of convenience. It’s also about the quality of the brew. If the flow rate or heating is too slow, it will make your coffee taste more sour. Another feature you could look for is a timer. A programmable coffee maker will allow you to make coffee the night before and set it to begin so that coffee is ready when you wake up. If you know your morning is going to be hectic or so early that the thought of preparing coffee on the spot makes your head hurt, a timer will save the morning. 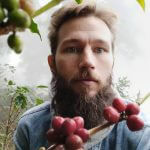 However, it’s important to remember that this kind of coffee will have serious compromises taste-wise, because it means that you will have to grind the coffee at least the night before you’re going to brew it. No genuine coffee snob would grind the beans more than 15 minutes before brewing. Stainless steel, glass or plastic? You’ll also need to decide if you want a glass, stainless steel, or heavy-duty plastic carafe. Steel is a good option, since most thermal carafes will use this material. Another benefit is that it’s sturdy and looks premium. Plastic seems a lot cheaper, and the only real benefit is that it’s more sturdy than glass. Glass is popular among coffee aficionados because it doesn’t add any off flavors and is easy to clean. The downside is that it’s often fragile and won’t keep your coffee warm for long.